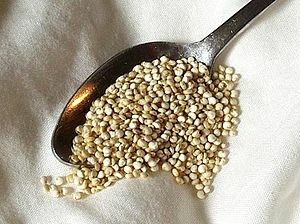 Quinoa is crop which is grown primarily for its edible seeds. Quinoa is highly appreciated for its nutritional value. It is widely called a “Super-food” which is a great source of complete protein. It is commonly used as ingredient, flour and a side dish in many parts of the world. It is recommended and essential that if you have had allergies to other grain products, then utmost care should be taken in trying out Quinoa. Although generally, quinoa is not considered to be a highly allergy causing food, but any food new to the body can cause allergic reactions. It is highly recommended for those diagnosed of celiac disease or some kind of gluten allergy. Due to the nutritional value, Quinoa is considered better than other grains that are gluten free. Most food allergies trigger similar reactions in the body. However the following symptoms are associated with Quinoa allergy. Any chemical substances created could sometimes lead to skin inflammation, and other complications in the digestive tract, lungs and sinuses. Symptoms such as coughing, tightness of the chest, difficulties in breathing and wheezing are associated when the patient’s lungs become swollen. When sinuses are swollen, you can develop sinus headaches, congestion, postnasal drip and sinus pressure. Eczema, skin rashes, overall swelling and itches. Gastrointestinal reactions mostly include stomach pain, vomiting, diarrhea and nausea. All food items containing protein could cause a reaction in the body if the immune system is not functioning properly. Your immune system could mistake the proteins in the food for a potential danger to your body and so in trying to fight against the harm, it secretes chemicals to protect itself from danger and get rid of the proteins. Inability to inhale and exhale. A heightened heartbeat that is faint. A decline in blood pressure. Facial swelling and pale skin.